With the release of Kiss Each Other Clean now just on the horizon expect to see the name Iron and Wine cropping up more and more in the next week or two (see earlier post to hear the new album live). 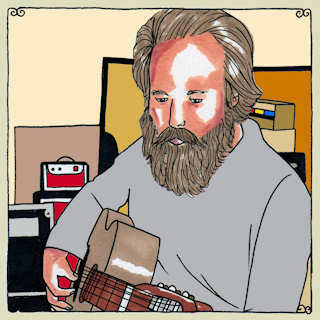 Todays news is that Sam Beam has finally recorded a session for Daytrotter and is available free for streaming and download. You can now Watch the full Daytrotter performance here. If you are wondering who is providing the beautiful harmonies it is none other than Rosie Thomas. Check out the video for "Red Rover" below with Sam Beam returning the favour on backing vocals. Cant wait for this album! Seems to be introducing some electronics to the recording process so really really looking forward to it.